Where to Buy Reliable Low Cost 1000BASE-T SFP Modules? Gigabit Ethernet, as a part of the Ethernet family of computer networking and communication standards, has been in the market for more than 15 years. 1000BASE-T Gigabit Ethernet is the most successful networking technology in the history. Delivering Gigabit performance over up to 100 meters of twisted pair cabling (Cat5 UTP), it is ideal solution to upgrade network smoothly without change its original architecture and decrease the cost of upgrading for a wide range of enterprise and embedded networking applications. When investing in 1000BASE-T SFP module to keep the highest working quality for business, everyone wants to find the best deals when they come to their network hardware, but also with the same compliance certification and quality. So where to buy reliable low cost 1000BASE-T SFP module? This article will tell you answer. 1000BASE-T SFP copper transceiver is based on the SFP Multi Source Agreement. It is compatible with the Gigabit Ethernet and 1000BASE-T standards as specified in IEEE 802.3z and 802.3ab. This Gigabit RJ45 copper SFP transceiver module supports 1000Mbps over Cat5 cables with RJ45 connector interface, which operates on standard Cat5 unshielded twisted-pair copper cabling of link lengths up to 100 m (328 ft). So those 1G copper SFPs can plug into any standard SFP interface allowing for 1000BASE-T Gigabit transmission. 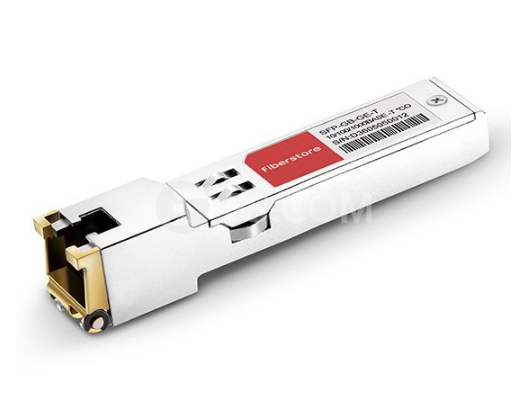 When referring to the types of 1000BASE-T copper SFP modules, there are generally three types of Cisco 1000Base-T SFP: Cisco GLC-T, Cisco GLC-TE, Cisco SFP-GE-T.
GLC-T is the Cisco 1Gb copper SFP, which is compliant to IEEE 802.3, and operates over Cat5 copper wire for a distance of 100m. It provides 1Gbps data transfer and full-duplex Gigabit Ethernet connectivity to high-end workstations and between wiring closets over existing copper network infrastructure. 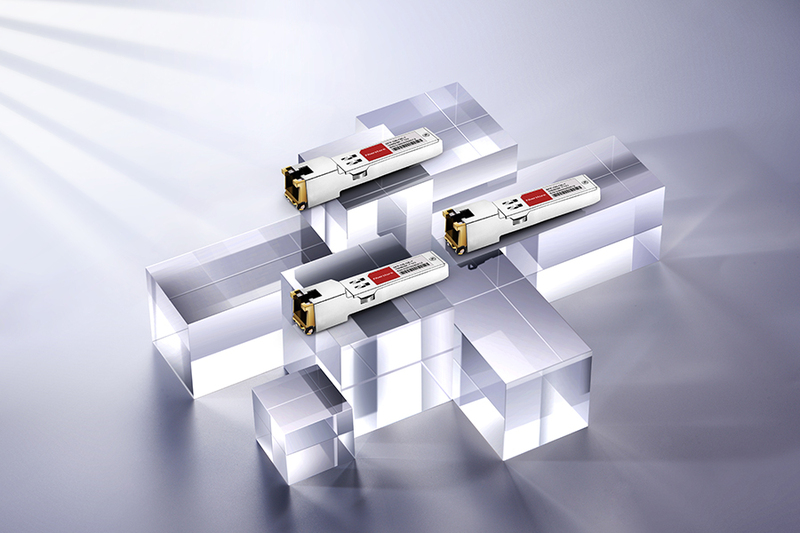 Similar to GLC-T SFP modules, GLC-TE provides a link length of 100m over Cat5 copper wires. The only difference between these two SFP modules lies in the operating temperature range. GLC-T SFP is commercial temperature range (COM) from 0 to 70°C (32 to 158°F), while GLC-TE is Extended temperature range (EXT) from -5 to 85°C (23 to 185°F). SFP-GE-T is Cisco copper SFP transceiver that works with 1000BASE-T. This 1Gb SFP RJ45 module is with spring latch for high density applications. The most difference is that SFP-GE-T has the function of NEBS 3 ESD. (NEBS is short for Network Equipment Building System and is a set of standards for building networking equipment which can withstand a variety of environmental stresses.) Therefore, SFP-GE-T supports extended working temperature. Where to Look for Compatible Cisco 1000BASE-T SFP? There are all sorts of resources to get the most out of technology budget, especially when it comes to find the Cisco 1000BASE-T SFP modules either for brand new, refurbished, or gently used. What are the best ways to find them for a much more inexpensive price? Online retailers with warehouses not only provide consumer-side purchasing with modules and networking hardware, they can also be a valuable asset to all sorts of companies looking to spend less money on equipment. There are online retailers that give almost as high as 90% discounts and price reductions. You need to be careful when it comes to certain warehouses as they might have huge savings but the parts might be used or not of the highest quality. Certified sellers, or re-sellers, can offer brand new or refurbished modules with great prices. Besides, they have professionals who can help you with all of your technology questions and make sure that you get the best deal. In fact, there are many third party vendors to manufacture compatible SFP modules, such as FS.COM, 10GTek, Finisar, Fluxlight etc. Many people are confused about whether I should use 3rd party SFP modules. Most “third party” transceivers are made and assembled in exactly the same plants assembling officially-branded transceivers. There is almost no big difference between an official Cisco transceiver and a third-party plug, aside from the branding and about two hundred to a few thousand bucks. And now, using 3rd party SFP modules seems to more and more popular, as many 3rd party SFP module vendors are providing high quality and reliable 3rd party SFP modules with low prices. Besides, third-party SFPs can be as reliable as official OEM products. The 1000BASE-T SFP copper transceiver offers a flexible and simple method to be installed into SFP MSA compliant ports at any time with no interruption of the host equipment operation. It enables for seamless integration of fiber with copper LAN connections wherever SFP interface slots can be found. Such system is economical, it saves time, offers flexibility and eliminates the necessity for replacing entire devices once the customers have to change or upgrade fiber connections and you will benefit so much from it. Related Article: GLC-T vs GLC-TE vs SFP-GE-T: Which One to Choose? This entry was posted in SFP, SFP Modules and tagged 1000BASE-T SFP, 1g copper sfp, 1gb copper sfp, 1gb sfp rj45 module, gigabit rj45 copper sfp transceiver module by Stephanie.Li. Bookmark the permalink.